How much does it cost to travel to Casablanca? How much money will you need in Casablanca? MAD550 ($57) is the average daily price for traveling in Casablanca. The average price of food for one day is MAD154 ($16). The average price of a hotel for a couple is MAD636 ($66). Additional pricing is in the table below. These average travel prices have been collected from other travelers to help you plan your own travel budget. How much money do I need for Casablanca? Casablanca is so much more than a classic Bogart movie with killer one-liners. It is also the largest, most cosmopolitan city in the country of Morocco. Sitting at the economic and industrial heart of this region, Casablanca has a population of approximately four million. Brush up on your high school French before visiting this lively city as it's the main language spoken by the locals. While this is the most liberal and progressive city in Morocco, remember to be cautious in this region of the world with your western views. Casablanca is often a stopover city for most travelers, but that's simply because they aren't aware of the amazing sights to be seen. For example, the King Hassan II Mosque is a sight you want to check off your list. This mosque is the largest in Morocco, and third largest in the world. As only one of two in the county open to non-Muslims, you'll certainly want to take a look around while you have the opportunity. Once inside, you'll be greeted with stunning interior features like an open skylight and intricate tile work. If you haven't gotten your fill of gorgeous buildings, head over to Mahkma du Pacha. This building, designed with Hispanic and Moorish influence, is comprised of over sixty ornate rooms complete with detailed wood-carved ceilings, stuccoes and meticulous wrought-iron railings. You won't even want to step inside for fear of scraping the gorgeous tiled floors. And if you need to get in just one more gorgeous piece of architecture, make a stop at the Villa des Arts. This 1934 Art Deco building holds a black and white, marble staircase that will have you yearning for more elegant days. Check the schedule, as this place offers regular concerts and readings. For those travelers more interested in immersing themselves in the local culture, a trip to the Old Medina should make the itinerary. Take a stroll through this small, traditionally walled-in town for a taste of that real Moroccan spirit. The best spot for a traditional and authentic experience, however, visit Casablanca's central market. It's a small space decorated by white walls and tile roofs lined with flowers. Stock up on produce, dates, nuts and, of course, the Moroccan cure for everything  argan oil. With the Atlantic Ocean along the northwest of the city, La Corniche runs in a diagonal direction along the water. In the center of the waterfront lies the old Medina stretching inland, as well as the somewhat modern King Hassan II Mosque (look for the tall tower that is the minaret). The newer part of the central city is to the southwest of the old Medina, and here you can find many hotels, restaurants, and shops. The main train station (Gare ONCF Casa Port) is to the east of the Medina near the port, and offers services to most desintations throughout Morocco. Casablanca is the type of city that likes to enjoy the finer things in life. If you absolutely must give your Fitbit it's required number of daily calories burned, hop in a soccer game at the Parc de La Ligue Arabe. This is the city's largest green space and the perfect getaway from the traffic and noise of the city. In Casablanca, they know how to enjoy the nightlife. Wait for the sun to set and the party to begin along La Corniche. This waterfront boulevard serves up every type of drink with every type of soundtrack you can imagine. But of all the gin joints in all the towns in all the world, you have to visit Rick's Café. (You knew there would be a movie quote in here at some point!) An American diplomat looking to inspire movie fans runs this themed bar. This bar has traditional architecture, a Moroccan piano-man and the movie playing on a loop. Don't let the cheesiness chase you off  the drinks are still amazing. It's not an exaggeration to say that Casablanca has meals to please all palettes. Bear in mind, though, they may be meant for those with a higher budget. Also, be sure to call ahead of time since most restaurants don't open until 7 pm. Transportation around Casablanca is much like you will find in many European cities. A tram system operates throughout the city from 6 am to 10:30 pm, while private companies run the bus system. That makes the bus the cheapest option, but definitely not the safest. The routes are unclear and you'll need to be on high alert for pickpockets. Casablanca's taxis are the red cars zipping through the city. Be aware, many taxis in this city run more like a bus system  they pick up passengers along the way and stick to a specific route. Be sure to ask the driver if your destination is on their way. Casablanca doesn't necessarily have all of the sites of Marrakesh or Fez, but it does have a stunningly beautiful and surprisingly modern Mosque. 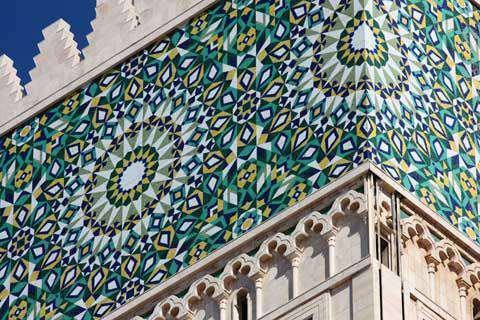 Even if you're in and out of Casablanca in one day, head to the mosque as it's not to be missed. The best time to visit is a sunset when the low light strikes the mineret and tiles beautifully. If you're interested in photography this is the best time to capture the shadows.